While in Brittany, I couldn’t wait to try some of the local food that I had heard so much about. First stop was a cozy crêperie in Auray, where a galette topped with salad greens and paired with a glass of local cidre made for a delicious, light lunch. A galette, by the way, is the savory version of a crêpe, and in Brittany they make them with buckwheat flour, or blé noir. I’m a terrible cookie monster, and it seems that every town has at least one biscuiterie. In Pont Aven, I stopped in to sample some of the crunchy, salty-sweet cookies made with the local buerre salé. As delicious as those were, there was still one local treat that I had to taste, and that is the kouign-amman. This decadent creation is what happens when puff pastry meets salted caramel. Rich and filling, it’s best shared with a friend (or two! ), and eaten while it’s still warm. If you’d like to try your hand at making one, David Lebovitz has a great recipe on his blog. Sweets are great, but I really love seafood. Since Brittany has more than 2400 km of coastline, you’ll find plenty of fresh oysters, langoustines, lobsters, and just about any kind of seafood you can imagine. And the port city of Duoarnanez is just one of many places where you can visit a conserverie, like La Pointe de Penmarch, where they sell a huge variety of preserved fish, in colorful decorative tins. 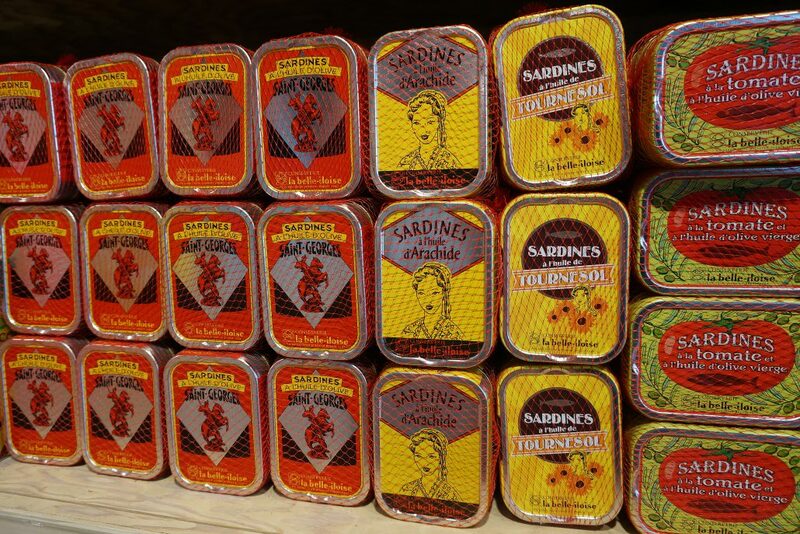 Sardines, tuna, and mackerel are canned simply in olive oil, or with flavors like harissa, herbes de provence, or biere blanche. Whatever you eat in Brittany, it will go great with some of the local cider. Especially delicious are the champagne-like brut cidres made from the juice of the first pressing of apples. Because they are naturally carbonated and without additives, these “pur jus” cidres are more flavorful and nuanced than mass-produced ciders. There are many cidreries to visit in the region, and the local markets have a great selection, so you can stock up for next to nothing, and bring a taste of Brittany back home with you.